On the face of it, Bobby Jindal embodies an extraordinary story that began unfolding as of last week’s official announcement: Jindal is the first Indian-American in history to mount a serious nationwide campaign for President of the United States of America. He is a smart Rhodes Scholar who entered politics at a very young age. Indian-Americans have reached the heights of glory such as national spelling bee championships (over and over again), the Miss America crown, Fortune 500 CEO positions including at Microsoft and Pepsico, State Governorships in South Carolina and Jindal’s own Louisiana, lead roles on television shows such as Quantico, senior administration roles in Washington, and other noteworthy achievements. The presidency looms as the last mountain left for the community to climb, and there is a now a (dark) dark horse contender in that race for 2016. All of that being said, Jindal presents an exquisite conundrum for Indians and Indian-Americans. Despite critical political and financial support from Indian-Americans including many from outside his state and political party, Jindal has repeatedly run away from his Indian heritage. He changed his name from Piyush, fancying himself as a Bobby after the character he liked to watch on the Brady Bunch as a boy. He renounced his parents’ Hindu religion, in favor of the Catholicism widely practiced in the bayous of Louisiana. Jindal’s brand of Christianity is more extreme than most, including an admiration for the exorcism of demons from people as he wrote about witnessing while studying at Oxford. All of these are personal decisions that few would hold against him in a national race, but in the last week he has taken a further step, going out of his way to vehemently downplay his Indian background. ““We’re all Americans. When my parents came to America, they were coming to be Americans. I’m tired of hyphenated Americans. 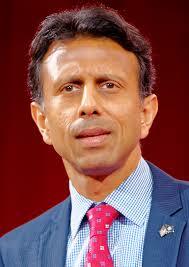 We’re not Indian-Americans or African-Americans or Asian-Americans,” Jindal said in his super PAC ad. “They should adopt our values. They should learn English. And they should roll up their sleeves and get to work,” he said in specific reference to immigrants. These words are controversial for several reasons. Many immigrants find this type of holier-than-thou rhetoric insulting, with clear insinuations that they are failing to work, failing to adopt certain values (whatever those may be), or not learning English quickly enough. Additionally, many Americans are proud of their heritage, whether that is Irish, Mexican, or Indian in background, and maintain close ties to their homelands and their hyphens. People proudly speak their native languages daily, whether they know English or not. This is especially true of the Indian-American community, in a strongly bipartisan tradition. Jindal’s words are not sitting well with many immigrants as well as non-immigrant Americans who see America differently and feel it is not political candidates’ place to patronize others. There is no reason to doubt that Bobby Jindal is being completely authentic and true to his beliefs rather than attempting to make political hay during a fraught Republican primary. By positioning himself as tough on immigration and hyphens, he is taking a stand that he was well aware would cause an adverse reaction. In fact we are quite sure he means every word of it. As authentic as they are, his words have not sit well with millions of people who are just getting to know him. Another issue for Indian-Americans is Jindal’s political position. Polls showed that Indian-Americans were overwhelmingly in favor of Obama over Romney, by a factor of three to one in 2012. They tend to be mostly liberal, though there is a very powerful Indian bloc vested in the Republican party. Yet Jindal is trying to prove himself to be the most conservative of the lot, and that’s saying a great deal. Jindal has additionally made a policy of not going to bat for India. He has pointedly stayed away from the Congressional Caucus on India and Indian-Americans. He did not join dozens of other US politicians who greeted Narendra Modi in a festival-like atmosphere during his maiden voyage to America as Prime Minister of India. Jindal has not entered the diplomatic fray when it comes to US-India relations. And so we now come to the conundrum, whether Indian-Americans, and Indians in general, should support Jindal’s bid or not. For many, the excitement of any Indian standing shoulder to shoulder with other candidates is enough to throw their weight behind that person. However, it’s probably a brand of identity politics that the majority will not follow. usindiamonitor congratulates Bobby Jindal for running, and we wish him luck. We admire a man who stands behind his principles. 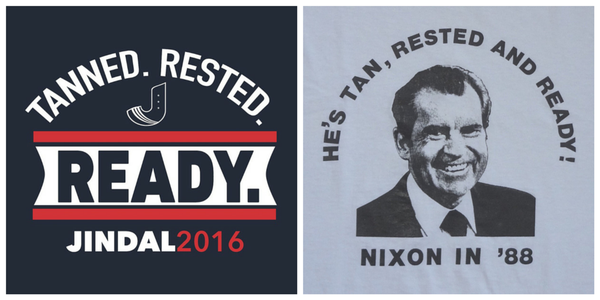 “Tanned, rested, ready,” says his campaign T-shirt, which you can buy for $20 while making fun of the people making fun of him. Interestingly enough, he is not the first politician linked to this slogan. We certainly would not endorse voting for him in either the primary or general elections, simply because we do not find him to be an impressive governor, or leadership material on the national level. Posted on July 2, 2015, in Politics/Diplomacy and tagged 2016, Bobby Jindal, Indian-American, Indo-US, US-India, US-India Relations. Bookmark the permalink. 1 Comment. Well written piece Mahanth. You clearly state facts surrounding Jindal not all of which are flattering. Nevertheless he is an energetic candidate and one we all can admire in one respect or another. The Republicans are fielding a large array of candidates — too many IMHO. So, it would in any case be difficult for any one in the field to emerge as a strong favorite for sure.